The US Geological Survey (USGS) has a little tool called the Coastal and Marine Video and Photograph Portal, through which you can view some remote and scientifically fascinating regions of the country as easily as you would a street in Google Maps. It’s like a Google Earth, complete with Street View, for the nation’s rich geography regions. When you pull up the map, you can toggle layers of photographs and data, and find specific points of interest along the coastal regions. I was able to “travel” the entirety of the northern Alaskan coast and Hawaiian coasts, looking at coastal reefs and seabeds the entire time. If you have any interest in the more geologically sensitive areas of the US, and want to explore what the region looks like, the photo and video portal will give you an accurate look from the sky. You can customize the basemap to your liking, whether it be satellite imagery or basic black-and-white. From there, you click on the highlighted region you want to explore, and the map will show you all the photographic data in the region. The videos are timestamped to a specific region, and almost every region comes with detailed photos of the seafloor. You can also download all of the metadata, if the interactive map isn’t enough for you. 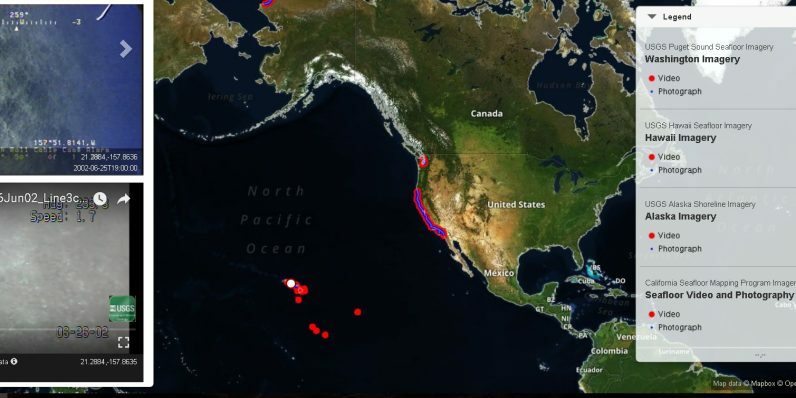 Don’t expect vacation-level pics of the Hawaiian coasts, but if you’re interested in the deeper areas of the sea around the US coasts, then this portal provides a great visual aid. We’ve reached out to the USGS for more information about the portal and will update if we receive any information.